Today, we give you a brief explanation why your device suddenly gives you headaches after updating it to Android Lollipop. In this post, we give you the reasons why Android Lollipop causes problems to a wide range of devices, months after its release. Google’s decision to switch from Dalvik Virtual Machine to Android RunTime (ART) is both a blessing and a curse for Lollipop users. On paper, ART is better in terms of extending battery life and improving overall performance over Dalvik because of one major difference — AOT compilation. AOT stands for Ahead-of-time compilation. This feature is used by ART runtime to transform app language or code into a code your device understands. In simplest of terms, AOT approach compiles or interprets app codes before they are launched, potentially increasing the opening speed of apps. This is beneficial for a device because apps will only be compiled once during installation, greatly lessening the need for the processor, which in turn, is good for the battery. This is in contrast to how Dalvik does things. In Dalvik, app codes are interpreted or transformed into your device native code via Just-in-Time (JIT) approach. This means that your device only starts to compile apps at the moment that they are launched. The interpretation or transformation process of codes takes longer time because your device needs to use more resources to gather all necessary files, compile the app, and load everything up to the RAM. Your device will continue to run perfectly until it has used all its RAM in the process. Once RAM is full and more apps are being queued, the first app that was run will be removed to accommodate the new ones. The constant loading and unloading of apps in RAM can significantly affect the overall performance of a system over time. One significant drawback of ART though is its need for more storage space. Because it compiles apps before they are launched, it requires about 10% more storage space than Dalvik. This is one of the causes of storage issues right after installing Lollipop. If your primary storage device is almost up to full capacity during the update, potential problems can occur ranging from freezing, slow loading time for apps, to missing files. Lollipop is a major overhaul of the phone’s operating system so phones and app settings will be modified to fit into the system. Although the plan is to make it as flawless as possible, many users have reported problems right after the update most probably because of this. With each app having its unique system file directory and configuration, it’s almost impossible for Google and their hardware maker partners like Samsung to iron out problems effectively. Lastly, Google and its partners cannot be blamed entirely for the whole fiasco. With tens of thousands of apps in Play Store, it can’t be expected that all of them are updated or up to the standard Google wants apps to be when Lollipop was released. Even months after the initial release, many apps are yet to be updated or debugged so they work in harmony with the new operating system. The problem here is with the developers. Not-so-popular apps may not be profitable for them so it may not make sense to improve them, especially after Lollipop was released. Even well-maintained apps like Facebook and Twitter hit snags during the release of the new OS. It’s also worth noticing that some of your carried over apps from KitKat may have worked fine when installed to the storage device before but not anymore after Lollipop update. Again, as Lollipop brought a lot of changes that includes remapping of file directories, there’s always that chance that some of the critical files for your apps may have been moved somewhere or even got deleted in the process. Sounds like Lollipop is a huge mess, right? Well, not exactly. If you consider the millions of smartphones running this OS now, all the literature created by a few hundred users on the Web (including our own troubleshooter series) that seems to preach the evil that is Lollipop doesn’t look like much. 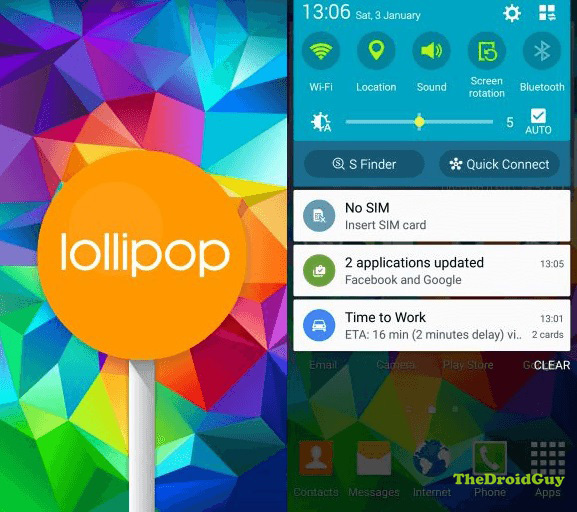 Lollipop is a pretty solid operating system that offers a lot of new things to make your Android device more interesting. Despite all the negative hypes this OS receives, we still recommend that installing it is worth it. Here are the potential solutions that you can try. This is the first thing you must do if you encounter multiple issues after an update. The cache partition is a special part of your storage device that keeps frequently used app and data components. As you upgrade to Lollipop, certain sets of data may no longer be relevant or may have been changed, resulting to slow loading app problems or freezing. Deleting the cache will instantly fix the issue. Clearing the cache partition will not delete any personal data so it’s perfectly safe to do. Your device will automatically create a new cache as you continue using it. This is very useful to isolate whether the issue is being caused by third party apps or firmware. Safe Mode was added in Android 1.7 Donut to help users identify rogue phone applications. When enabled, safe mode should prevent third party apps from running although it doesn’t work all the time. specially built apps to ignore diagnostic mode may still run. In Safe mode, all user-settings are suspended that includes your beloved wallpapers. If you notice a problem after downloading apps, booting the phone in safe mode is a good way to give you a shortlist of apps to start from. While in safe mode, you can continue using the basic functions of your phone like calling, sending of messages, connecting to the internet, etc. If only one app fails to work properly after updating to Lollipop, try deleting its cache and data. You can do this instead of clearing the cache partition of your phone when dealing with a single problematic app. Keep in mind that deleting an app’s data may result to personal data loss depending on the app. For example, if you are clearing the data of your contacts app, that may lead to the phone erasing your call history and messages. Make sure to create a copy of your personal data before hitting clear data button. Bloatware refers to apps added by carriers to a device to promote often redundant features and functions. They can sometimes cause performance issues due to factors mentioned above so it’s best if you deal with them rather than leave them alone. If you are not particularly fond of them, try to see if you can uninstall them. Most of the time you can’t so your best course of action is to simply disable them. Just go to the same menu where you can delete an app’s cache and data and look for the disable button. This is our friend. In fact, this is our only effective friend that can help us resolve most Lollipop related problems at this point. Even if you contact Google or its partners, factory reset is always their most recommended potential fix when it comes to solving Lollipop issues. Sure it’s demanding and a hassle but it gives your device a much needed respite. One important thing to remember to ensure that factory reset is worth all your effort is to be careful with apps you install in your device. If you continue to encounter problems after performing a factory reset, you may be installing the same outdated apps. One good way to eliminate bugs is to wipe storage devices clean. Try to format your primary storage (internal) and secondary storage (SD) devices. If all solutions appear to fail, consider getting a new replacement. Keep it simple. If you are one of the users who encounters a problem with your device, let us know. We offer solutions for Android-related problems for free so if you have an issue with your Android device, simply contact us by email at [email protected] and we will try to publish our answers in the next posts. We cannot guarantee a quick response so if your issue is time sensitive, please find another way to resolve your problem. When describing the problem, please be as detailed as possible so we can easily pinpoint a relevant solution. If you can, kindly include the exact error messages you are getting to give us an idea where to start. Fortunately I’m driving so my Rath I will not text!!! !